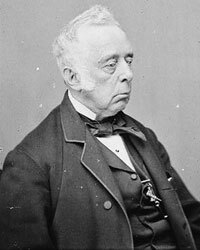 Reverdy Johnson was a Senator from Maryland (Whig, Democrat, 1845-49, 1863-68), Attorney General (1849-50) under President Zachary Taylor and Minister to Great Britain (1868-1869). A key supporter of Stephen Douglas in 1860, Johnson became a proponent of emancipation although at the outset of the Civil War, he was a pro-slavery Democrat and opposed emancipation in District of Colombia in 1862. Johnson’s stature as a constitutional scholar was useful to the President. “With a delegation of prominent Baltimoreans, Johnson came to Lincoln to learn if he meditated invasion of the South, and thought the contents of Lincoln’s confidential answer of April 24, that he intended merely to protect the capital, were speedily transmitted to the Confederate authorities, through Johnson’s incautiousness, yet relations of cordial support of Lincoln by Johnson were established for the time. This led Lincoln to request Johnson to answer [Roger B.] Taney’s opinion in Ex parte Merryman, as to the right of the President to suspend the writ of habeas corpus.”3 Johnson, supported President Lincoln against Chief Justice Roger Taney on the dispute over the suspension of habeas corpus. But he fought the administration on its dismissal of General Fitz John Porter after the Second Battle of Bull Run. Yours of the 16th by the hand of Governor Shepley is received. It seems the Union feeling in Louisiana is being crushed out by the course of General Phelps. Please pardon me for believing that is a false pretense. The people of Louisiana — all intelligent people everywhere — know full well, that I never had a wish to touch the foundations of their society or any right of theirs. With perfect knowledge of this, they forced a necessity upon me to send armies among them, and it is their own fault, not mine, that they are annoyed by the presence of General Phelps. They also know the remedy — know how to be cured of General Phelps. Remove the necessity of his presence. And might it not be well for them to consider whether they have not already had time enough to do this? If they can conceive of anything worse than General Phelps, within my power, would they not better be looking out for it? They very well know the way to avert all this is simply to take their place in the Union upon the old terms. If they will not do this, should they not receive harder blows rather than lighter ones? Johnson later supported President Andrew Johnson on Reconstruction. President Johnson then appointed Senator Johnson as U.S. Minister to England. Johnson had been opposing counsel in McCormick patent case in which Mr. Lincoln participated. He was also counsel for Mary Surratt in the assassination conspiracy trial until he resigned over an insult to his character from the military tribunal that were acting as judges in the case. Bernard C. Steiner, Life of Reverdy Johnson, p. 50. Steiner, Life of Reverdy Johnson, p. 44. Steiner, Life of Reverdy Johnson, p. 51. Steiner, Life of Reverdy Johnson, p. 58 (Letter from Benjamin Butler to William H. Seward, September 19, 1862). Annotated by the Lincoln Studies Center, Knox College. Galesburg, Illinois (Letter from Reverdy Johnsonn to Abraham Lincoln, July 16, 1862). Abraham Lincoln Papers at the Library of Congress. Transcribed and Annotated by the Lincoln Studies Center, Knox College. Galesburg, Illinois (Letter from Abraham Lincoln to Reverdy Johnson, Saturday, July 26, 1862). Michael Burlingame, editor, Dispatches from Lincoln’s White House: The Anonymous Civil War Journalism of Presidential Secretary William O. Stoddard, p. 77 (May 5, 1862). Steiner, Life of Reverdy Johnson, p. 94. Steiner, Life of Reverdy Johnson, p. 75 (February 9, 1864). Steiner, Life of Reverdy Johnson, p. 78 (April 4, 1864). Noah Brooks, Mr. Lincoln’s Washington, p. 136 (March 13, 1863). Steiner, Life of Reverdy Johnson, p. 61. Steiner, Life of Reverdy Johnson, pp. 81-82. Howard K. Beale, editor, The Diary of Edward Bates, 1859-1866, p. 413 (September 29, 1864).